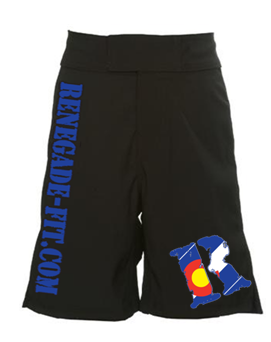 Renegade Fitness: FINAL DAY – Fight Shorts Pre-Order! TODAY IS THE FINAL DAY TO PRE-ORDER YOUR SHORTS!! It’s time to pre-order your pair of our newest product! The Renegade Fitness FIGHT SHORTS are here! I’ve owned a pair of these shorts for almost a month now to try them out for myself, and believe me when I say they are incredible. I’ve never worn “fight shorts” to do CrossFit before, but no other pair of shorts has been as comfortable for me. There’s a drawstring and incredibly secure Velcro, so regardless of what I’ve been doing, they’re stayed completely secure. The slit up the legs is just high enough so I have not had ANY restrictions when squatting/running/jumping/rowing, and it’s low enough to not show my incredible man-thighs to the world the rest of the time. Check out these images of what they’re going to look like! We are so excited! 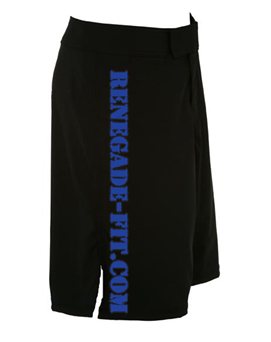 Our Renegade Fitness Fight Shorts! Our Web Address down the leg! Make sure to go to the Pre-Order Page today, and don’t forget to write what SIZE you want in the “Comments” section of your order. Pass the link along to friends too, please. We know there were a lot of people interested in this product, and we’re finally making it happen for you guys! Thanks so much, Robby! We couldn’t have found the awesome shorts without you guys! Thank YOU!